Its overall objective is to develop ecosystem-based strategies for adaptation to climate change in three Latin American Model Forests – in Bolivia, Argentina and Chile. “We wanted to understand the processes that may lead to a durable change in the way local actors deal with water resources and related land uses – a change required in light of the potential impacts of climate change on the availability of these resources and the subsequent risk of increased conflicts in terms of access to these resources,” said Bastiaan Louman of CATIE (http://www.catie.ac.cr/en/) and Regional Coordinator for Latin America and the Caribbean in IUFRO’s Special Programme for Development of Capacities (http://www.iufro.org/science/special/spdc/). 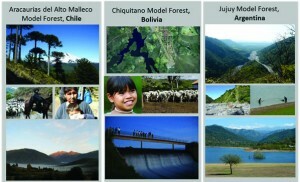 Mr. Louman was one of the authors of: Creating and sharing new knowledge through joint learning on water governance and climate change adaptation in three Latin American Model Forests: The EcoAdapt Case, published as IUFRO Occasional Paper 30. The paper indicates that climate change adaptation is about risk management to secure water, food, fiber, timber and other means of livelihood. And, while noting that managing climate risks is a long-term undertaking, it points out that recent climate change trends underline the necessity for active measures to improve the resilience of people and landscapes to the adverse effects of a changing climate. The paper provides insights into possible approaches for action-research projects that can promote learning among involved stakeholders. The underlying principle in the EcoAdapt project is that all knowledge is valuable, and both researchers and local actors benefit from adopting a knowledge culture based on joint learning. So the approach combines traditional knowledge and land management practices with new science-based information to create a solid basis for developing viable climate change adaptation strategies. “To adapt,” said Mr. Louman, “we need continuous learning processes, and for these to be effective and efficient we need to learn how these processes work. “That means allowing for a dialogue of knowledge areas; knowing the cultural, socioeconomic, political and environmental context; identifying local motivation to learn; creating an environment that facilitates both collective and individual learning; and identifying common goals,” he said. One of the more surprising things the authors discovered was that much locally available information was not being used in the design and implementation of local strategies. To address that issue, and to accomplish the project’s overall goals, Mr. Louman hopes that long-term financing for translating newly generated knowledge into action can be secured.